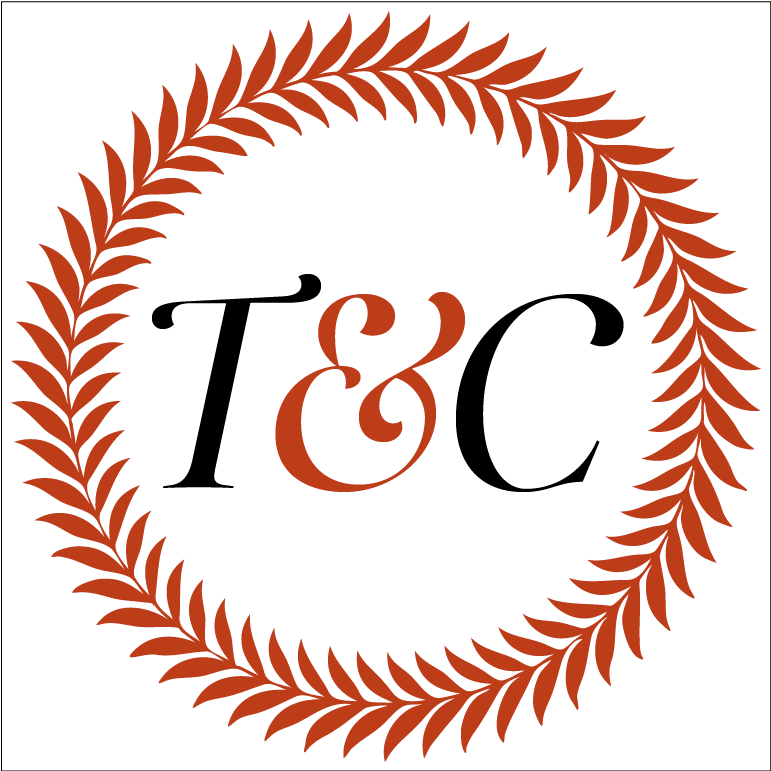 With less than two months until Prince Harry and Meghan Markle's wedding, Town & Country spoke with Fiona Cairns, the pastry chef who made the eight-tier fruitcake for the Duke and Duchess of Cambridge's nuptials in 2011. 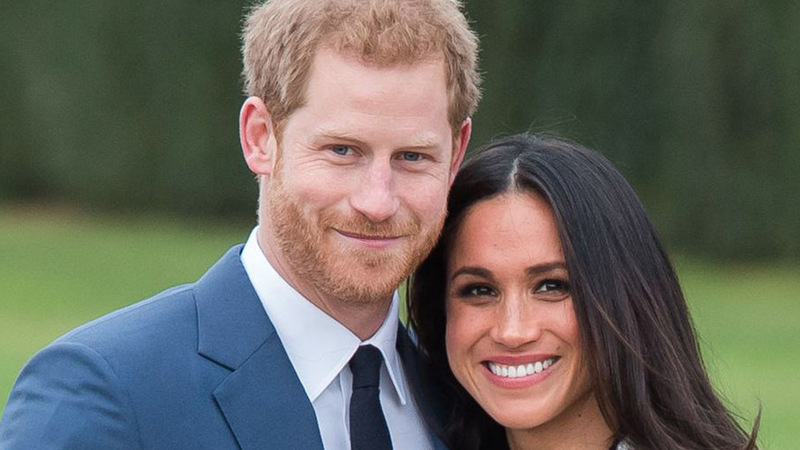 Here, she shares all the things you didn’t know about what goes into make a royal wedding cake. YOU DON’T HAVE TO KNOW THE ROYAL FAMILY PERSONALLY TO BE ASKED TO MAKE ONE OF THEIR WEDDING CAKES. But it’s a plus if they’ve eaten your cakes before. 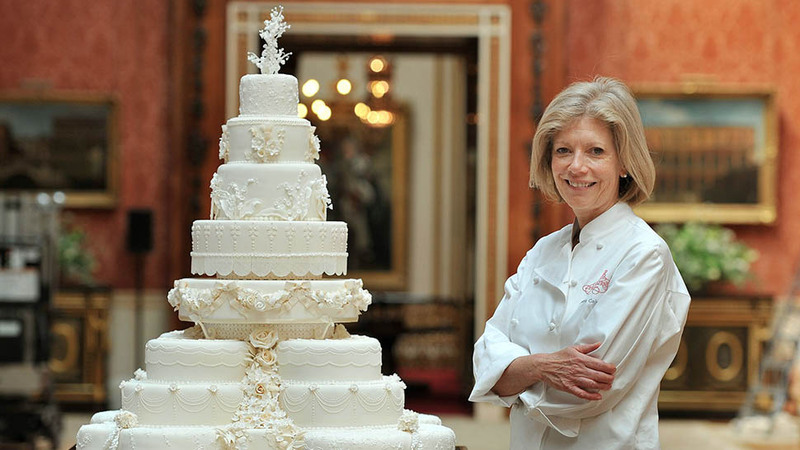 Before baking the royal wedding cake in 2011, Cairns had made several cakes that the royal family—including Prince Charles and Princess Diana—had eaten at various events in the past. In fact, before they approached her to make their wedding cake, “William and Kate were already familiar with our fruitcake,” Cairns says. But 2011 marked the first time she had ever worked directly with the royal family. JUST LIKE ANY OTHER BRIDE, THE ROYAL BRIDE HAS THE FINAL SAY IN WHAT THE WEDDING CAKE LOOKS LIKE. 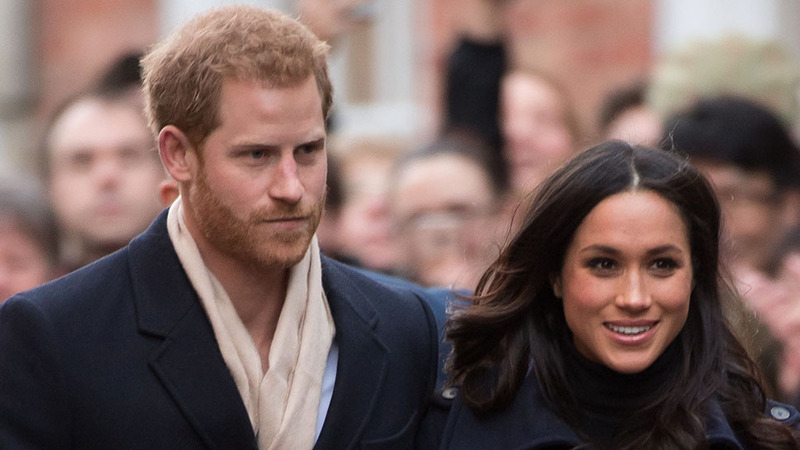 With so many traditions and protocols to follow, you’d think the royal couple wouldn’t have any say over what their wedding cake looked like. But that’s not the case, Cairns says. 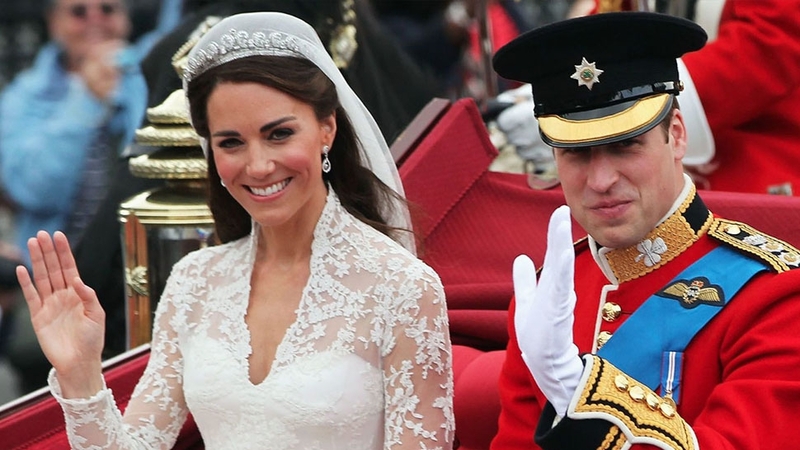 But that’s not to say Duchess Kate was even close to being a bridezilla. 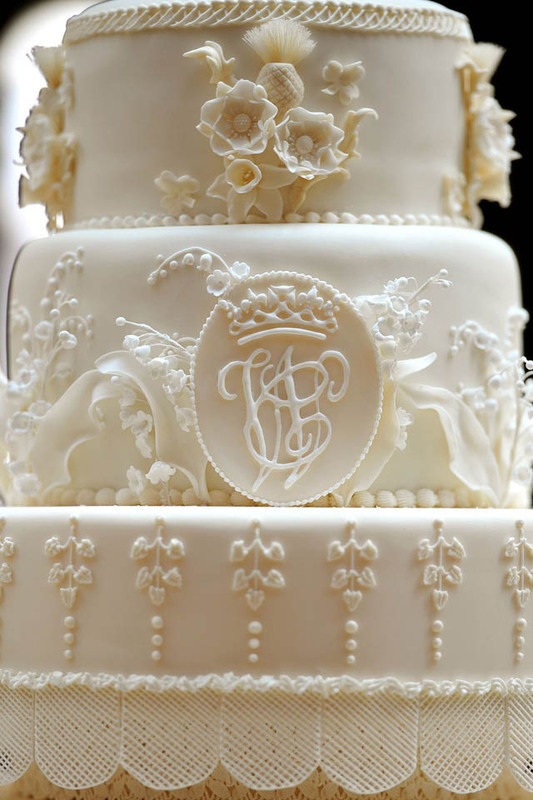 The details of the Duke and Duchess of Cambridge's wedding cake. 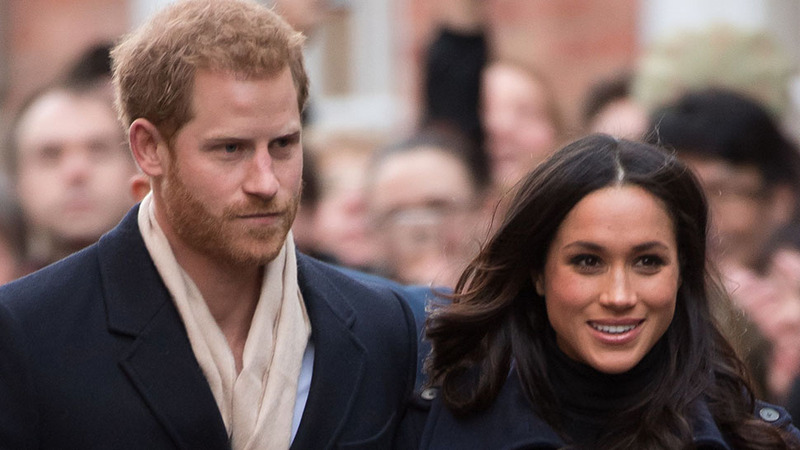 BAKING A ROYAL WEDDING CAKE IS EVEN MORE STRESSFUL THAN YOU’D THINK. 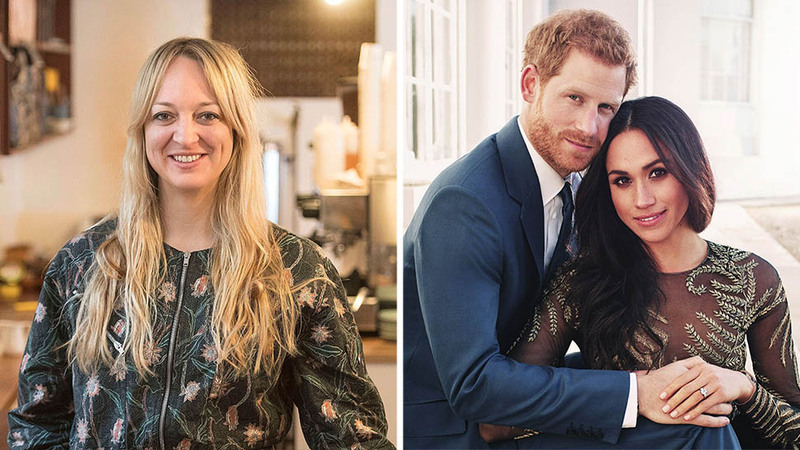 “We realized that it was a huge privilege that we were even being considered to make the wedding cake for the future king and queen of England. And it was an enormous responsibility from the very, very beginning,” Cairns says. As with any other wedding cake, Cairns wanted to keep the royal couple happy by delivering a cake that was as close to what they asked for as possible. But she also had the additional challenge of working in tight secrecy leading up to the big day, in order to not ruin any surprises. IT TAKES MONTHS OF PLANNING. A fruitcake must be baked months in advance, so Cairns and her team started the process almost immediately after meeting with the royal couple. “We were commissioned on February 18 and the wedding was April 29, so we baked all the cakes at the beginning of March, so [they had] two months to mature,” Cairns explains. Then several days before the wedding day, Cairns and her team showed up at Buckingham Palace to start building the eight-tier fruitcake. Because sponge cake doesn't have the same shelf life as a fruitcake and fresh flowers don’t keep the same way sugar flowers do, Harry and Meghan’s baker, Claire Ptak, will have an even shorter time frame to get everything together since she’s working with layers of sponge, buttercream, and fresh flowers to make their elderflower and lemon wedding cake. While Cairns and her team had several months to prepare the cake layers and several days to build the entire thing at the palace, she estimates that Ptak and her team will only have a few days before the wedding to do it all. Cairns's team finishes building the royal wedding cake at Buckingham Palace in 2011. ROYAL WEDDING CAKES ARE MUCH BIGGER THAN REGULAR WEDDING CAKES. But it’s not necessarily because of the large guest list. At William and Kate’s wedding, Cairns’s wedding cake was displayed in the massive picture gallery in Buckingham Palace. In order not get dwarfed or lost in such a big room, it had to be big. The three-foot-tall cake ended up weighing 220 pounds and took an entire team of people two and a half days to assemble it. 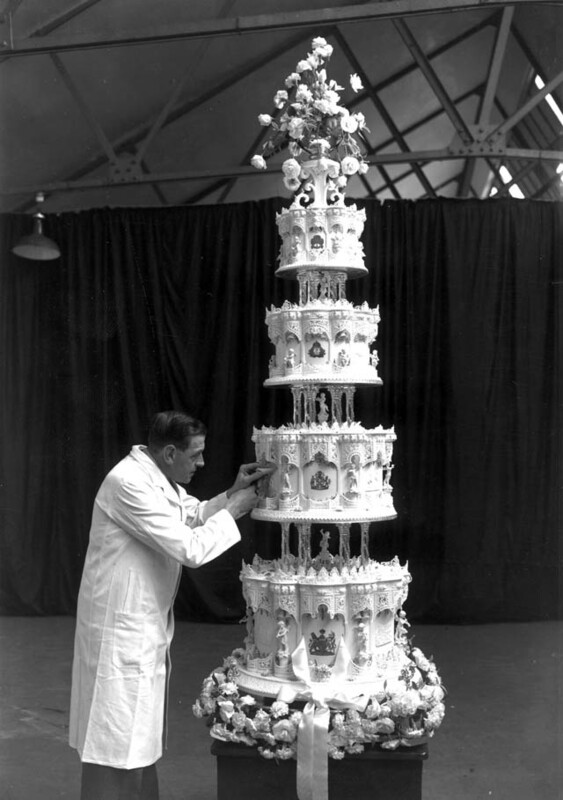 Queen Elizabeth and Prince Philip's 9-foot-tall cake for their 1947 wedding. BUT ROYAL WEDDING CAKES DON’T NECESSARILY HAVE TO BE TALL. While Queen Elizabeth and Prince Philip’s 1947 wedding cake was nine-feet tall, Cairns says that the Duchess of Cambridge made it very clear from the beginning that she did not want a very tall cake. 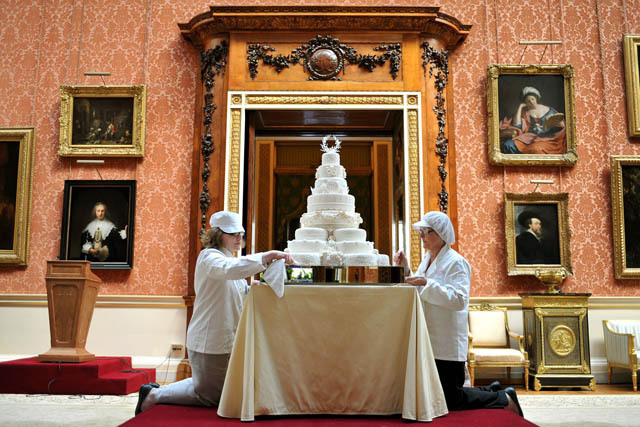 To fill the space at Buckingham Palace, Cairns made William and Kate's eight-tier cake as wide as it was tall. While their one-meter wide by one-meter tall cake is still massive by regular wedding cake standards, by royal standards it’s considered to be one of the shorter and more modest cakes in history. NOBODY ATE THE WEDDING CAKE YOU SAW AT WILLIAM AND KATE’S WEDDING. “The actual cake itself, which went on display, was not served at the wedding,” Cairns tells Town & Country. After spending two-and-half days building the cake you saw in photos, Cairns and her team then went down into the kitchens of Buckingham Palace to cut 600 separate slices of fruitcake for the breakfast on the day of the wedding. An additional 4,000 slices that Cairns and her team baked were also sent out by the Prince of Wales in tins as gifts. TRADITIONAL FRUITCAKE ISN’T THE ONLY OPTION. Ever since Queen Victoria’s time, a rich fruitcake has been the English wedding cake of choice, Cairns explains. But that doesn’t mean royal family members are required to serve fruitcake at their wedding, as evidenced by Harry and Meghan's choice to serve an elderflower and lemon cake. 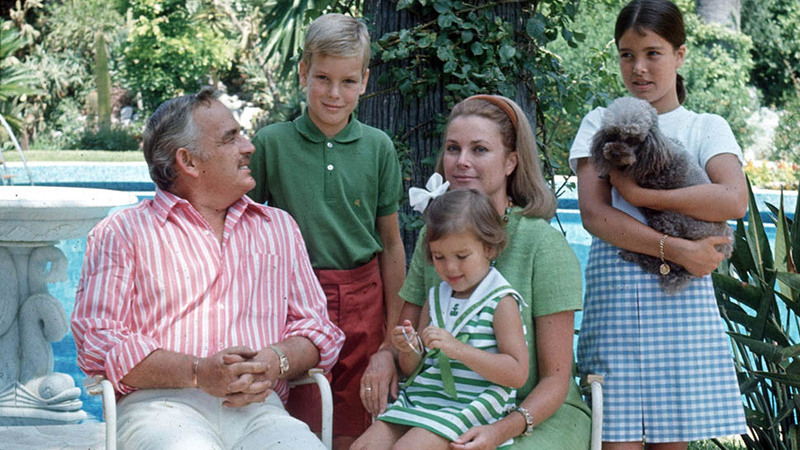 In fact, Prince Harry and Meghan Markle aren’t the first royal family members to opt for something a little less traditional at their nuptials either. Prince Edward and Sophie Rhys-Jones served a seven-tier devil’s food cake baked by Linda Fripp at their 1999 wedding. That said, William and Kate never discussed having anything other than a traditional fruitcake, Cairns says. The top tiers of the royal wedding cake were saved for future christenings. MOST ROYAL COUPLES SAVE THE TOP TIERS OF THEIR WEDDING CAKE FOR THEIR FUTURE CHILDREN’S CHRISTENINGS. 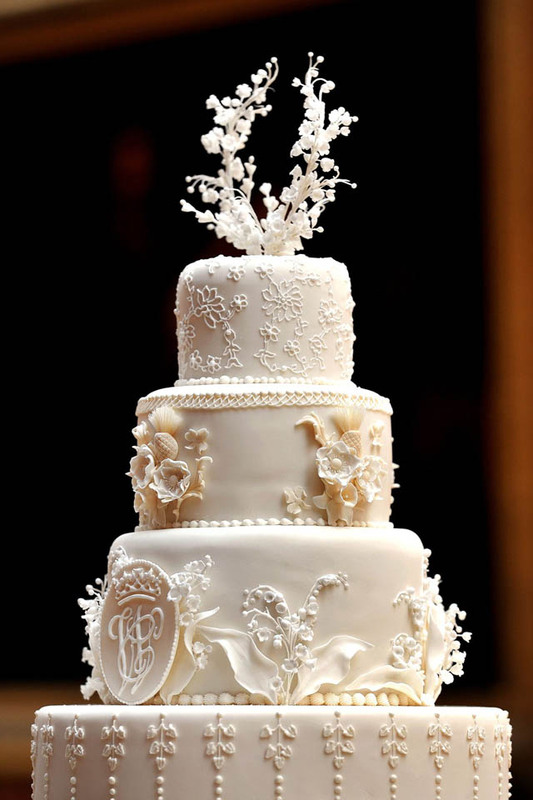 Following British royal tradition, a tier from the wedding cake Cairns baked for the Duke and Duchess of Cambridge was served at Prince George’s christening in 2013. While Cairns can’t comment on whether a third layer of William and Kate’s wedding cake will be served at the christening of Royal Baby No. 3 later this year, she was involved with both Prince George and Princess Charlotte’s christenings. IT’S NOT A ONE-PERSON JOB. Cairns also mentions that her husband, Kishore Patel, was instrumental in getting her team the royal commission. “He is the one with the business acumen and vision to have built up the cake business in the first place,” Cairns says.